Hi, my name is Sharon, and I'm a fabriholic. The time has come for an intervention. and do my best not to buy any fabric in 2014. As you can see I have enough to play with already. and the couple of Bolts (yes I have bolts) of fabric even lower! (this photo was also taken before all my "April Showers" Stash arrived and of course it does not show my tower of Bonnie and Camille Jelly Rolls. I am going to give myself a little leeway though. Any new Bonnie and Camille ranges will be an exception to the rule! Also, I have a couple of quilts in the planning, more on those soon, so if I don't manage to purchase the fabrics for them before Jan 1st then they will also be an exception to the rule! - Save the $$ I spend on stashing. For me. For what I am not sure yet. A deposit for a nice new machine might be nice. 1) No "just because" fabric purchases for 6 months beginning January 1, 2014.
a new project then I will allow myself to buy fabric, after shopping my stash first! But I WILL NOT buy fabric "just because". Pop on over and see Jess. haha... $10 you won't manage it! ... well I won't send you $10... I'll send you a mug rug!!!! Oh good luck with that. Sorry I can't join you.......I have commitment issues! Good on you Sharon - destashing is a great guilt relief. A couple of years ago, a friend was involved in sending in craft supplies and all sorts of goodies to schools in the Philippines - I had a huge clean out and it was wonderful. The last couple of years I've been using my stash and trying to finish off UFO's - it's time for me to freshen up the stash. Sounds like the perfect program for me! I'm going to go check it out. Sign me up! Actually. No don't. I won't be able to stick to it. I did that this year, and there is no visible depletion of fabrics!! LOL. I even pieced backings from left over fabrics from the quilt tops instead of buying backings. But the drawers are still full to overflowing, and I have bits tucked in some incongruous places. I allowed myself to buy some border fabric, for two quilts, and just this week, a little bit of Christmas fabric on sale. Does this mean I have to sign up again this year Sharon??? 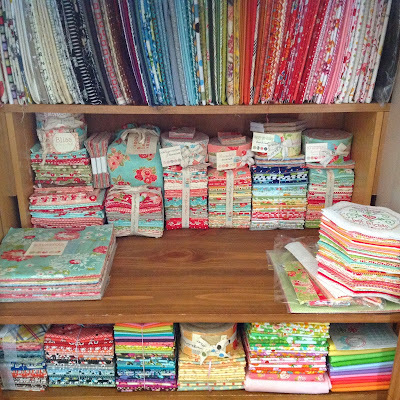 I was going to say that it's wrong to commit to buying no fabric but now I've seen a picture of your stash I can understand why, that's a hell of a stash! How good does your stash look. Too good to use, am sire you will give in, heheheh, i will have to keep,watching to see if u stick to your goal and not be tempted. I did that in 2013 and it felt great! Still have fabric to use as well. 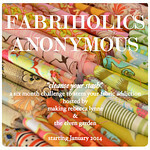 Good luck with your fabric diet - I'm looking forward to the challenge! Good luck, Sharon. I hope you are successful! You obviously have some very lovely fabrics to work with in 2014. I am spending some time visiting blogs of people in the FHFS group and am loving looking at the projects you have made. My quilting friend and I actually did this in 2012. I resisted the idea at first, but then decided to go with it. It turned out to be a great way to save some money. I really should do another year, though, as I still have quite a large stash. Oh that would be really hard! I don't know if I can do that. I do know that if I don't get some of my UFO's or WIP done, there will be no room for me in the sewing room. I already did a post on my blog the W/E about a Messy sewing room..... Well my lunch break is done, I have to go back and sew some more.